Hey hey, it’s Pineapple Sorbet! Laura over at eatdrinklive is hosting up HHDD#13 and this time it’s Sorbet. I really have no idea who this Donna person is, but I’m always ready for another challenge. The goal was to come up with a sorbet and we’ll all be judged and prizes will be awarded. Anyways, here’s my entry: Pineapple sorbet. I have a real soft spot for tropical fruits and pineapple is no exception. I could easily peel a pineapple and eat the whole thing in one sitting, yes I love pineapple. On a recent trip to Hawaii I was lucky enough to find local pineapples, on sale, for ONE DOLLAR! Needless to say I had about a dozen pineapples during the week and probably should have smuggled a few in my luggage, just in case. Even after all of that pineapple, it is still one of my favorites. This recipe is everything you’d want in an easy summer sorbet: minimal ingredients, easy prep, and PINEAPPLE! I decided to add rum at the last minute to keep the sorbet a bit soft, since pure fruit sorbets tend to get rock solid in the freezer. Feel free to adjust the sugar accordingly; all pineapples aren’t created equally so you will have to decide if the mixture is adequately sweetened before you let the ice cream machine perform its magic. Combine sugar and water. Heat until sugar has dissolved. I used the microwave but you can use the stovetop if you wish. Peel and core the pineapple. Coarsely chop and puree in blender. Slowly add syrup while blending. Process in ice cream machine according to manufacturers directions. I wish I could find a pineapple for $1. This looks so refreshing. Thanks for joining in at Hay Hay Its Donna Day. Yeah for cheap pineapples in Hawaii! 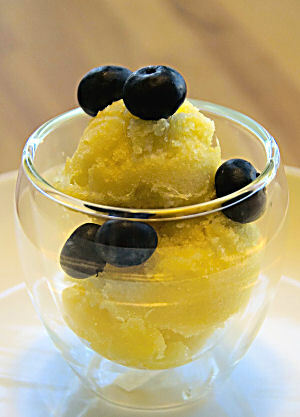 I’ve been racking my brain lately trying to think of an unusual sorbet, this looks great. I’ve never tried blueberries with pineapple, how is it? I would bet this sorbet tastes great on its own, but subtle pairings are great for bold sorbets. This looks like the perfect sorbet. I love it when I am able to find perfectly fresh pineapples.